UV, optical, and NIR Light curves of the counterpart of GW170817, as well as best-fit models. 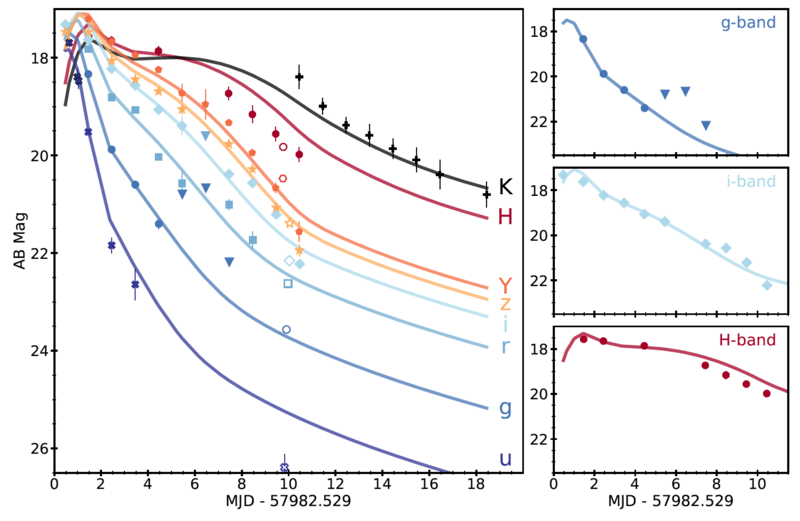 Our photometry of the optical counterpart to GW170817 obtained by the Dark Energy Camera exhibited many of the behaviors expected for a kilonova. The transient was both redder and declined much faster than a typical supernova. The object was initially blue, but quickly transitioned to red within a few days. This indicated that the kilonova models suggesting multiple emission components might offer the correct picture. This qualitative behavior was suggestive and enticing, but in order to make rigorous statements about the transient behavior we attempted to model the observed light curves. We needed R-process models with multiple components to describe the transient. The models indicated a total ejecta mass of about 5 percent of the sun’s mass with a low opacity, high velocity (about a third of the speed of light) component, and a high opacity, low velocity (about a tenth of the speed of light) component. The data and these models show that the optical counterpart to GW170817 is a kilonova and supports the idea that neutron star mergers are dominant sites of r-process production in the universe.